San Francisco-based non-profit Southern Exposure gives out annual grants to visual artists as part of its Alternative Exposure program. 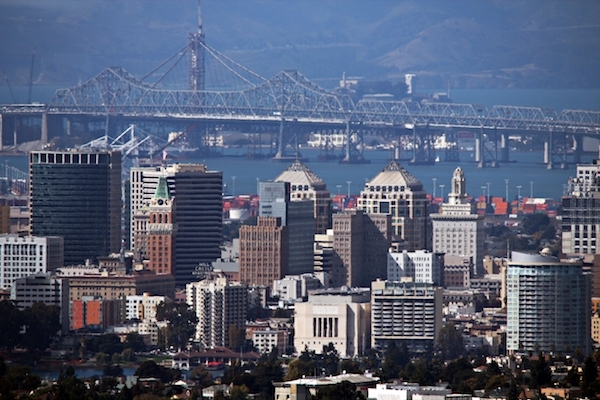 And every year more of that money is moving across the bay to Oakland, a trend that some observers say reflects an artistic revival in the working class East Bay city. This year, 10 of the 16 recipients of the grants, which range from $2,400 to $5,000, are in Oakland. When the program started in 2007, just two grants were awarded to East Bay artists. Courtney Fink, executive director of Southern Exposure, says the shift mirrors economic and demographic changes in the Bay Area. The Alternative Exposure program, which is funded by the Andy Warhol Foundation for the Visual Arts, supports grassroots artists who, according to Fink, “fill a cultural gap.” Recipients must be engaging the public in some way, sometimes through educational programming, and they must be self-funded. Tessa Watson’s gallery and studio OGAARD, which received a $4,700 grant, is one example. Located in the Golden Gate neighborhood of North Oakland, OGAARD works with and showcases textiles. Despite California’s reputation as a hub for craft culture, Watson was unaware of any other studio space in the Bay Area devoted solely to textiles until OGAARD opened last April. While working her day job as a stylist for Restoration Hardware, Watson has paid all of the project’s costs out of pocket, with no intention of making a profit. “I’m not rich, I’m just hardworking and spend what I have,” adding that she will use the grant mostly to build a website and for day-to-day maintenance of the studio. All the grant-receiving artists are working within the “economy of generosity,” Fink said. The program is a way of recognizing and fueling that economy. “People will do these things without us, but by funding them we’re acknowledging their contributions,” Fink said. Among the other Oakland-based recipients are two film groups: Shapeshifters Cinema, an interactive video series at Temescal Arts Center, and Black Hole Cinematheque, a micro theatre and film archive in a West Oakland garage. Other grant recipients include education-aimed projects like Uptown-based hacker space Sudo Room and Bay Area Public School, a free, alternative education project. With high rent a continuing challenge in San Francisco, the grassroots arts movement that Alternative Exposure aims to support is likely to continue its migration eastward. According to Fink, the arts boom in Oakland is a “natural evolution” and, with support, grassroots artists could be a valuable resource for the city. Click here for a full list of the Alternative Exposure grant recipients.